What Will I Learn in an Online Graduate Certificate in Educational Technology Program? 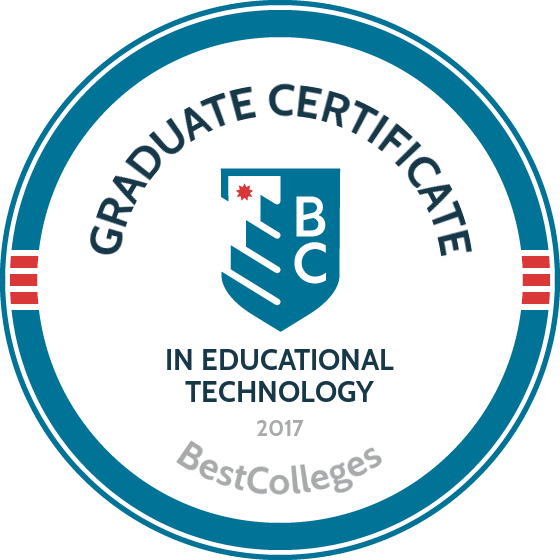 WHAT ARE THE BEST GRADUATE CERTIFICATE PROGRAMS IN EDUCATIONAL TECHNOLOGY? Educational technology plays an increasingly important role in formal educational settings like schools and universities. It is also used frequently by businesses and government agencies to facilitate employee training. However, many of these organizations do not understand best practices when it comes to introducing new technologies. Completion of an online graduate certificate in educational technology empowers teachers, educational administrators, and organizational trainers to deploy their high-tech skills for the benefit of others. Aside from jobs in education, the certificate can lead to lucrative careers in the private sector. For example, training and development managers can make around $106,000 a year, according to the U.S. Bureau of Labor Statistics. Every online graduate certificate in educational technology is different, which is why you should carefully evaluate the curricula and requirements of each program. While certificates may differ in emphasis, all educational technology programs share common characteristics. For example, core courses will likely look at various instructional methods for conveying complex information and ideas, while also proposing ways to measure student outcomes. Below you will find a sample curriculum that showcases some common educational technology courses. Instructional Design: This course covers best practices for planning, developing, and evaluating instructional materials. It teaches students how to assess learner needs and individual differences, plan educational outcomes, and sequence class instructions. Instructional design provides professional development tools to elementary, high school, and postsecondary teachers, allowing them to gain specialized knowledge about curriculum planning strategies. Models and Innovations of Educational Technology: Understanding best practices in educational technology requires knowing how technology has been used in the past. This course explores the history of successful educational technology applications and the ways in which these applications have been improved. Students will also learn about emerging technologies and mobile devices, and the steps involved with creating educational technology applications for the future. Online Teaching Methods: Teaching techniques that work in live classrooms do not always work, or are not always available, in online teaching settings. This course teaches the specific methods used by online teachers to convey information in virtual classrooms. It also gives hands-on instruction in using the most common online course management tools, such as Blackboard/WebCT. Web Tools for Learning: This course explores the ways that the internet can be used to facilitate learning. It emphasizes web 2.0 technology and the use of online video to present educational materials. It also outlines the skills needed to evaluate and select web resources based on effective research strategies. Since corporate training is increasingly conducted online, this would be a useful class for training and development managers. Established in 1887 to promote prosperity across the state, North Carolina State University continues to innovate well over a hundred years later. Today the school offers a variety of online programs and certifications, including over 350 online courses. NCSU's graduate certificate in teaching, training, and educational technology exemplifies its legacy of forward-thinking -- today the school offers one of the very best online educational technology certification programs in the nation. NCSU's graduate certificate in educational technology program consists of five courses. All 15 credits of the program are tailored to each participant's professional development. As such, the program offers five different possible areas of specialization: training and development, instructional design, e-learning, community college teaching, and community college leadership. Participants can also apply the credits they earn to relevant NCSU master's programs. The flexible and multi-purposed nature of the certification combined with its focus on what best benefits its participants makes the program shine bright among its contemporaries. A Washington, D.C.-based institution founded in 1821, the George Washington University offers a variety of notable online programs, including the school's top-ranked online graduate certificate in training and educational technology. Due to the school's proximity to the nation's Capitol, the school places a strong emphasis on all things government. In turn, a particular attention to detail and technicalities is one of the school's hallmarks, a fact evidenced throughout GWU's 18-credit graduate certificate in educational technology program. The program provides crucial training for professionals who intend to pursue positions in corporate or government environments, including director of training, training manager, or HR training specialist. Successful completion of program courses, such as managing computer applications and developing effective training with technology, can yield major benefits for professionals in the field. Based in the celebrated college town of Athens, the University of Georgia offers students 18 online degree programs and nine certifications. UGA's online graduate certificate in instructional technology for teaching program provides learners with a strong footing in the field and without requiring students to attend courses on campus. The school's online graduate certificate in educational technology consists of a 15 credit hour program. Applicants pay an application fee ($75 domestically, $100 internationally) and submit previous test scores, a statement of purpose, and official transcripts. Because the school tailors the program to the needs of current teachers, courses employ technology most effective in the classroom. The curriculum includes a capstone for which participants find a local mentor. The result is a rich field experience, providing learners a chance to apply what they learn beyond a virtual environment. The University of Illinois Springfield serves approximately 23,183 alumni and certificate holders in the region. An education leader in the state, earning an online graduate certificate in educational technology from UIS can yield major benefits for students in the educational technology sector. UIS designs its graduate certificate in educational technology to meet the needs of practicing teachers, allowing practicing professionals to bolster their abilities in the classroom. The program consists of 24 credits in six courses at a rate of $313 per credit hour for Illinois residents. Residents of Illinois must additionally complete the Illinois State Board of Education Specialist test to receive endorsement. Through classes such as online teaching and learning and teaching in the curriculum, UIS ensures that teachers in the region and beyond are well-prepared to embrace developing technologies in the classroom. As internet-based education continues to grow in popularity, Indiana University Bloomington continues to expand its offering of online courses and certifications. One of the school's most flexible and dynamic examples is its online graduate certificate for instructional systems technology. IUB's online graduate certificate in educational technology program consists of five courses that add up to a total of 15 credits. Whether to boost an established career or to prepare a student for further education, such as a master’s degree, the school designs the program to cater to the needs of current professionals. While 12 of the aforementioned credits are core classes, three are elective credits, for which participants may choose almost any other instructional systems technology course that fits their needs. Courses like evaluation of instructional and performance improvement systems can help just about any professional in the educational technology sector. Applicants should have a basic ability to operate and understand common computer applications. As urban research university located deep in the South, the University of North Carolina Charlotte offers students a variety of online programs and certifications, including the school's online graduate certificate in instructional systems technology. The school awards its graduate certificate in educational technology after learners complete an 18 credit hour program. UNCC tailors this program to the needs of instructional technology employees who want to develop and advance their education technology capabilities for corporate, higher education, government, and/or military settings. For this reason, the school administers three specializations: online learning and teaching, school specialist, and training and development. To qualify for UNCC's program, candidates must hold a bachelor’s degree and provide the school with official transcripts (with a minimum 2.75 GPA), a statement of purpose, and three letters of recommendation. Located in Grand Forks and established in 1883, the University of North Dakota offers a variety of online programs at notably reasonable rates, including the school's online graduate certificate for instructional design and technology. UND's online graduate certificate in educational technology program consists of courses that add up to 12 credits. The school offers these courses at a rate of $320.33 per credit for North Dakota residents, $406.81 per credit for Minnesota reciprocities, and $480.49 per credit for contiguous residents. UND administers the program both online and on-campus. While this allows for program flexibility, it also means that the program cannot be completed entirely online. The certification path offers three specializations: K-12 technology integration, corporate training and performance, and e-learning. Whichever path a participant chooses, learners can transfer certification to a master’s program at any point up to and past graduation. A progressive, ever-changing college, West Chester University of Pennsylvania dedicates itself to growing with the needs of its student body. In turn, the university continues to place an increased emphasis on online education. Learners can find a fine example of the school's approach in WCUPA's online graduate certification in educational technology. WCUPA's graduate certificate in education technology program consists of 18 total credits, including five required courses and two electives. The school intends the certification to meet the needs of working educators, aiming to support their educational skills with updated resources, experience, and technology. After completing the program, learners can expect to be well-prepared to serve their students with the latest in technical advancements. WCUPA is located in the southeastern corner of Pennsylvania and developed from a historic state normal school in operation from 1812 to 1869. A Christian educational institution located in Lynchburg, Virginia, Liberty University was founded in 1971. Since then, the institution has grown significantly, greatly expanding its campus and developing a notably strong online presence. Today the university offers learners over 250 online programs, including Liberty's online graduate certificate in educational technology and online instruction. The school's graduate certificate in education technology consists of three courses, together adding up to nine credits. Candidates apply online or by mail for a fee of $40, and must provide official college transcripts and hold an accredited bachelor's degree with a minimum GPA of 2.0. One of the program's more notable courses is technology and diversity, in which instructional technology learning goes beyond a focus on the concept of technology itself to analyze the diverse communities that interact with a variety of modern technologies. Founded in 1912, the University of Memphis is a notable Tennessee institution that offers a quality online graduate certificate in instructional design and technology. UofM's graduate certificate in educational technology is a 12 credit program that features two available tracks: education technology (intended for educators), or design and development (intended for other professionals). Though the program places an emphasis on the big picture of technological integration, it acknowledges the personalized experiences of individuals within the two tracks. The courses aimed at educators focus on social media, digital devices, and multimedia implementation, while courses aimed at professionals in other sectors, such as corporate and governmental, learn more about instructional models, technological implementation, and technology-based problem solving. Regardless of track, students must earn a minimum 3.0 GPA in all classes to complete the track and earn their certification. Located in scenic, mountainous, and relatively remote Boone, North Carolina, Appalachian State University places a strong emphasis on social responsibility. This emphasis appears throughout the school's programs, including the school's online graduate certificate in instructional technology facilitation. ASU's graduate certificate in educational technology is a part-time, 18 credit hour program intended to expand endorsement and licensure for K-12 educators. To foster a dynamic learning process, the program is both synchronous and asynchronous: one night per week, students and their classmates partake in a real-time virtual classroom but otherwise students may complete coursework on their schedule, excluding any online meetings with their instructor. The certificate curriculum challenges students to think critically about their digital work, with courses highlighting the social, legal, and ethical implications of digital technology, as well as accompanying new literacies. Educators enrolled in the program can expect to gain useful skills in topics such as technical analysis. Founded in 1852 and located in the historic city from which it takes its name, the University of Massachusetts Boston offers learners numerous online programs, including an online graduate certificate in instructional technology design. This online graduate certificate in educational technology program consists of five courses, a total of 15 credits, designed to prepare professionals to meet challenges presented by the ever-evolving nature of technology. Students gain training and aptitude for relevant work in academic, corporate, and public education settings. UMass Boston requires students to maintain a 3.0 GPA throughout the program to graduate. To apply, candidates must participate in an interview with program faculty and submit a statement of interest and intent, along with two letters of recommendation, a resume, a competitive score on the MAT, official transcripts from all previous collegiate work, and a graduation application. The school offers students a host of in-depth courses, including topics such as e-learning processes and collaborative learning designs. Located in the city of Adelphi, the University of Maryland University College offers learners a wide variety of dynamic programs, including online programs. UMUC's online graduate certificate in instructional technology integration program is an excellent example of the school's approach. The school's graduate certificate in educational technology program consists of five courses and 12 credits specifically geared toward pre-K-12 educators. To pursue the certificate, learners must earn a 3.0 or higher on all required coursework, and they must complete the certification within five consecutive years. Unlike some certifications on this list, the University of Maryland University College requires students to complete certification coursework before graduation from the college. UMUC was founded in 1947, making it one of the newer courses in this listing. Founded in 1966 and based in Catonsville, the University of Maryland, Baltimore County continues to encourage take-charge professionals in its programs. The school boasts a growing online program set that includes its instructional technology online graduate certificate. To gain UMBC's graduate certificate in educational technology program, students complete a 12 credit program designed for professionals who seek a foundation in computer and web-based instruction, and who intend study the place of multimedia in the classroom, examine how best to apply development tools, and dive into the latest in educational technology. Courses focus on topics including instructional development, instructional survey and applications, and multimedia project management. Students may apply this certificate toward a future master’s degree at the university. Learners who earn this certification may go on to become multimedia developers, instructional technologists, instructional designers, and trainers. A Catholic institution based in Duluth, Minnesota and founded in 1912, the College of St. Scholastica offers learners 16 different graduate certification programs. CSS's online graduate certification in educational technology is one of the school's best. Students earn CSS's graduate certificate in educational technology after completing a four class, 12 credit program. The school intends its program for classroom teachers, technology coordinators, curriculum specialists, and other educational technology professionals. After completing the program, learners hold the knowledge necessary to become technologically effective members of the workforce. The program casts a wide breadth and students choose from a variety of course options. The certification requires students to complete a single class (leadership/future trends in education) and students choose among eight other courses as possible electives. For admittance into the program, candidates must hold a B.A. or B.S. from an accredited college/university and a minimum GPA of 2.8. Online graduate certificate in educational technology programs are useful for several career tracks. Elementary and high school educators can learn to integrate new technologies into classrooms, and may want to understand how cutting-edge technology can improve learning outcomes. Certificate programs also produce competent online instructors, which is useful since the demand for online postsecondary instruction is growing. Below are some some common career paths for those pursuing online graduate certificates in education technology. High school teachers instruct students in academic and life skills that will benefit them in adulthood. They prepare and teach lessons, assign and grade homework, and administer assessments that measure student learning needs and outcomes. Instructional coordinators oversee the development and assessment of educational materials. They work with teachers, principals, and other educational leaders to implement lessons that meet student learning objectives. Postsecondary teachers instruct students who have graduated from high school in a range of academic and technical subjects. They also advise students, fulfil administrative duties, and conduct academic research. Postsecondary education administrators are responsible for providing various forms of student support services at colleges and universities. They may also support the research activities of faculty and other staff members. Training and development managers design and implement courses that teach necessary skills to employees and new recruits. They usually work outside of academia in corporate, nonprofit, or governmental settings. Accreditation is the main way of guaranteeing the quality of your online graduate certificate in educational technology. It is a process in which an external accrediting agency reviews an educational institution's admissions and curriculum policies, and determines whether they meet predetermined criteria for rigor and excellence. Accreditation matters because it allows students to transfer credits to new programs, secure financial aid, and gain recognition from potential employers. While the U.S. Department of Education does not engage in accreditation directly, it maintains a list of reputable accrediting agencies. The Council for Higher Education Accreditation also maintains a database of accredited schools and programs. There are two main kinds of accreditation. Traditionally, nonprofit, degree-granting institutions receive regional accreditation, whereas for-profit, career-preparatory institutions receive national accreditation. Although regional accreditation is more prestigious, national accreditation might be more appropriate for certain kinds of institutions, such as those engaged primarily in online education. In the field of education, look for accreditation from the Council for the Accreditation of Educator Preparation (CAEP) or National Council for Accreditation of Teacher Education (NCATE). While certificate programs are not always accredited like degree programs, online certificate programs offered by institutions with education departments endorsed by CAEP or NCATE are likely to be of the highest quality. Despite the popularity of online graduate certificate in educational technology programs, they can be difficult to finance. Federal student loan programs are usually only available for degree programs, and many certificate programs do not qualify. However, anyone interested in this course of study should complete the Free Application for Federal Student Aid (FAFSA) to determine their eligibility for financial aid in the form of grants, scholarships, loans, and work-study awards. Since the skills learned in this program are in high demand, some employers may offer tuition reimbursement. Private student loans are also be a good option for some students, although they may charge higher interest rates.